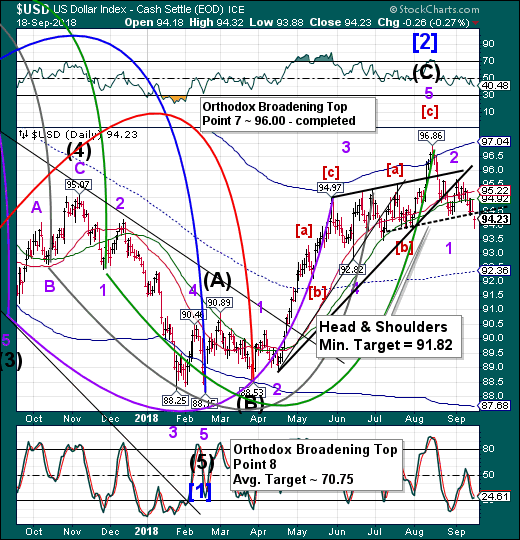 US Dollar Head & Shoulders Triggered. What's Next? 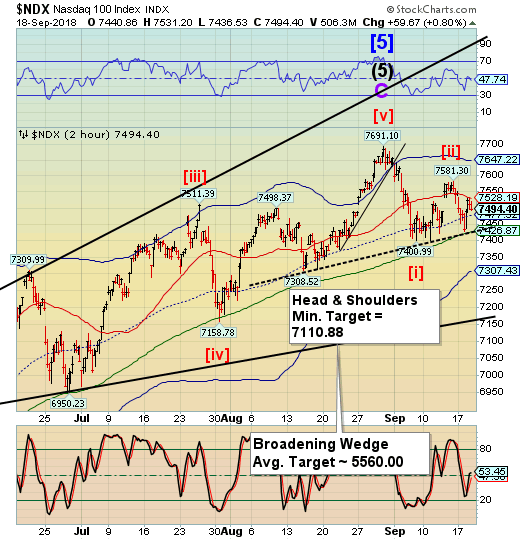 SPX made its final high yesterday afternoon. The top-to-top time was 12.9 days, fitting my thesis that the impulsive decline and retracement fits in Cyclical time. This morning’s futures are lower, indicating that a new impulse may be underway, although it may remain shallow for the better part of the day. 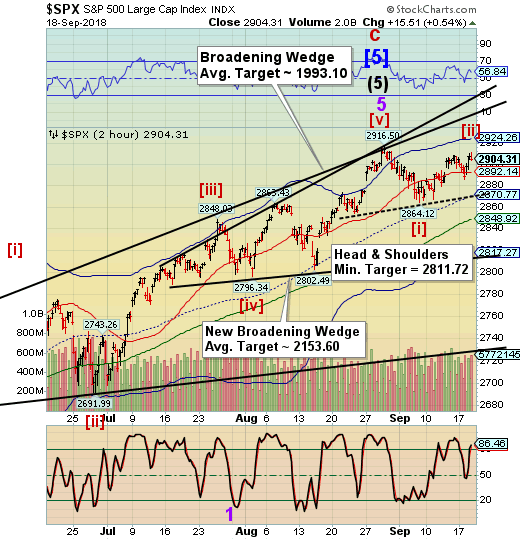 There is a potential Head & Shoulders formation that, when triggered, may send the SPX beneath its smaller Broadening Wedge. NDX futures are lower this morning as well, after being repelled at Short-term resistance at 7528.19. It also has a potential Head & Shoulders formation that, when triggered, may send it beneath its own Broadening Wedge pattern. CNBC reports, “China could target U.S. tech stocks as part of the ongoing trade war, according to the top equity strategist at Goldman Sachs. Peter Oppenheimer told CNBC's "Street Signs" on Tuesday that China may impose tariffs on industry components that could have an effect on supply chains. U.S.Technology firms could be first in the firing line, Goldman's chief global equity strategist added. VIX futures are nominally down this morning, after closing beneath the 50-day Moving Average at 12.81. The breakout above the 50-day Moving Average creates the buy signal, while the pullback affords a better entry for those wishing to go long the VIX. VIX ETFs are making a new Master Cycle low. They are in a window where a further low may be made, but should be complete by the end of the week, if not sooner. 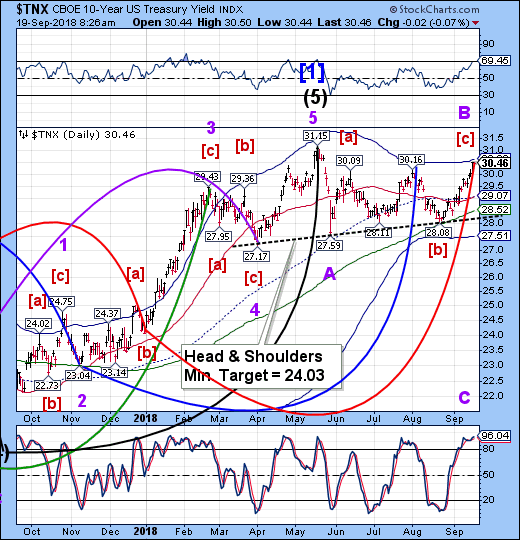 TNX appears to be probing the Cycle Top at 30.63, but hasn’t quite reached it yet. The futures show TNX at .20 higher than the cash index, but that is due to a time premium on the new expiration date, which is December 21. As you can see, SPX, NDX and TNX all have Head & Shoulders formations that haven’t been triggered yet. USD has triggered its own Head & Shoulders formation which suggests that the others are not far behind. It appears that the USD futures have already tested the underside of the neckline and may be resuming the decline. The Cycles Model suggests a strong decline may ensue over the next week. I have mentioned several times that the USD is the controlling asset. Where it goes, the stocks and treasury yields will follow.